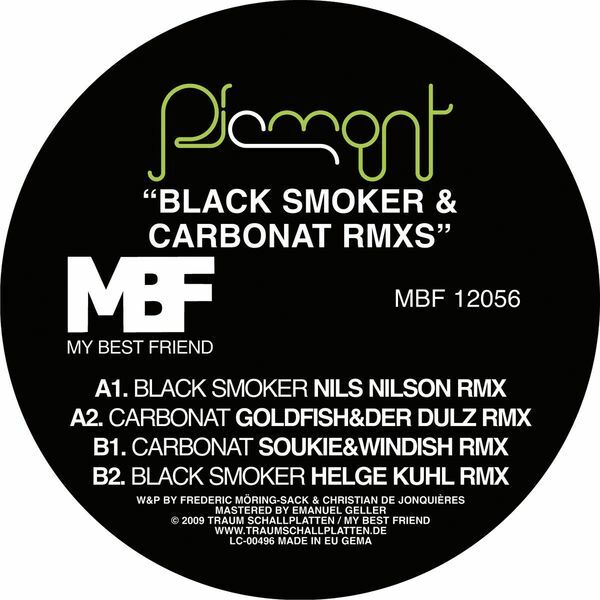 A good, solid set of remixes from the My Best Friend Stable, collecting interpretations of two Piemont originals. First up is a great Nils Nilson take on 'Black Smoker', forming a neat package of tight minimal rhythms, stabbing strings and a lively bassline. Helge Kuhl lays on a few more synths for his highly enjoyable, melodic version, while Matteo Millieri is more fixated on fleshing out the percussion and keeping the bass in focus. Goldfish & Der Dulz offer up a highly entertaining 'Carbonat' remix, full of playful, tuneful electronics and garish sound designs, while Soukie Windish are a bit more sensible, offering up filtered melodies and a sense of subdued depth.